Gypsy Stash by Paula: Call All Customers . . . Call All Customers . . . Calling all of my wonderful handmade soap customers . . . 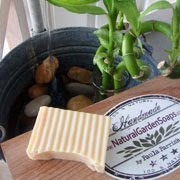 Send me photos of your handmade soap from Natural Garden Soaps in your creative setting at home. I will select a winning soap photo to be printed in my upcoming newsletter. The lucky winner will also receive a gift tote filled with natural soap and handmade bath accessories. Good Luck and Happy Picture Taking!